According to estimates, eleven million people in the U.S., both young and old, suffer from food allergies. Although allergens affect only a small portion of our population, the health implications can be serious. Allergic reactions lead to about 29,000 emergency room visits and 150 to 200 estimated deaths each year, according to a Journal of Allergy and Clinical Immunology report. Food companies are making allergen management programs an integral part of their quality systems. "Controlling Food Allergens in the Plant," an employee training program developed by Silliker, Inc. and the Food Allergy Research and Resource Program (FARRP) at the University of Nebraska-Lincoln, delivers the most current industry knowledge to help companies enhance their in-plant allergen training sessions. 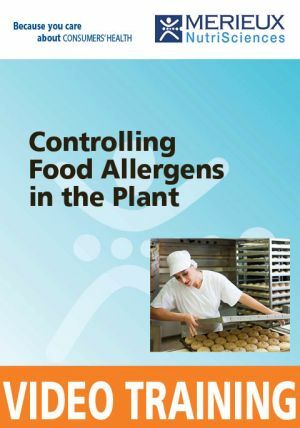 Cost for the training video program Controlling Food Allergens in the Plant DVD is $250.00. Click here to place your order on-line through the Mérieux NutriSciences Education Store secure ecommerce site. Or call Mérieux NutriSciences Education Services at: 312.938.5322.